It looks like things in the sun-soaked-state of California are becoming a little overcast. Although all forms of cannabis use became legal in the Golden State last year, how to implement mandatory potency and purity regulations is still a major point of discussion. As trailblazers in the legal cannabis world, California has been tasked with establishing testing protocol around a product that few have faced the challenge of creating legal health and safety standards for– which has been anything but a walk in a cannabis field. Before reaching consumers, cannabis in California is now required to undergo testing which includes ensuring the amount of THC in the bud matches the label, that mold, pesticides, or bacteria have not contaminated flowers, and checking THC is distributed evenly in edibles. “Mandatory statewide testing is a new thing and it’s going to take some time for everything to run smoothly, but on the whole we’re pleased with how things are progressing,” said Bureau of Cannabis Control spokesman Alex Traverso. So why is mandatory cannabis testing seemingly so difficult to tackle? Well, it faces more than a few challenges. One of the biggest challenges in potency testing is variance. Because of the natural variance of cannabis flowers, no two flowers are the same. This means that just because one flower in a batch carries a certain result, does not mean the results will be the same for the rest of the flowers in the same batch. Another hurdle is the lack of standardized testing protocol. With no standard testing protocol defined by the state and shared between labs, a common denominator on which to measure results is lacking. This is a major factor accounting for the discrepancies in results from lab to lab. 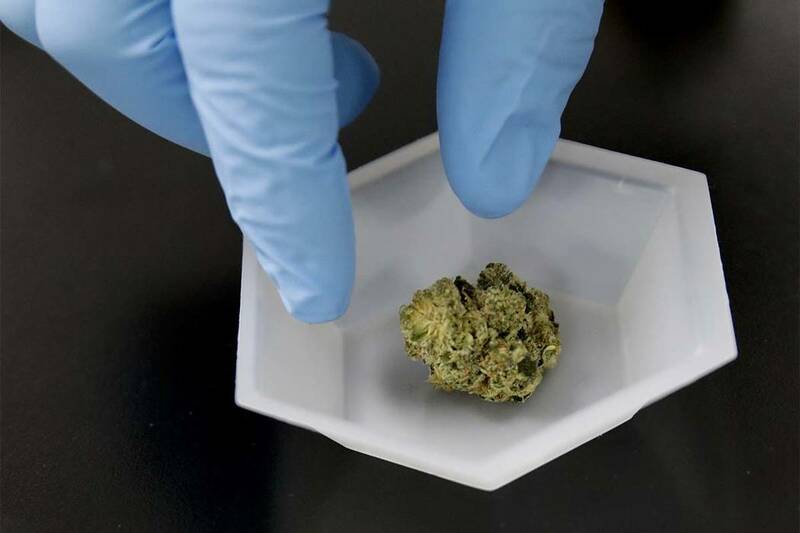 California regulations also stipulate that every sample be picked up from the client by a representative of the respective lab, or personally dropped off by the client to designated locations for later pick-up. Not only is this process costly and usually inconvenient for the client, but is a drain on man-power for the lab, making the process even more labor intensive. On a practical level, as the popularity and consumption of cannabis reach all-time highs, labs are unable to effectively and efficiently deal with the ever-increasing demand for testing. This means that those who send in a sample can be left waiting days, if not weeks, to receive results. In an on-demand society, this is not a desirable quality. From July 1st through Aug. 29th, when preliminary testing requirements were first enacted, of the 10,695 product batches tested by labs, 1,904 were rejected – a failure rate of about 18%. Among the cannabis categories hit especially hard by the newfound potency requirements were edibles. Nearly one-third of all edibles produced in California were banned from being sold at the begging of last year. One of the most common reasons a sample fails is because it carries a different potency than displayed on its label. Label vs. flower THC discrepancies accounted for 65% of the failures or 1,279 tests. For THC, rules state that the potency of the flowers must fall within a 10% range with advertised on a product label. With THC potency, 10% is quite a large margin of doubt. While the State is still struggling to understand how to implement regulation around the newly legal substance, many, including growers, feel they are being hit with the brunt of the trial and error phase. “Testing is currently costly, slow, and inconsistent,” the growers association wrote in an official letter to the State of California. Despite the growing pains of being trailblazers, as the industry grows, regulatory compliance requirements will further increase. Inevitably, savvy growers will adopt in-house testing methods to boost quality assurance, while ridding themselves of the cumbersome need of relying on costly and time-consuming external labs.